A lead ball, believed to be the oldest surviving cannonball in England, has been found at Eagle Drive on the site of the Battle of Northampton. The battle was fought between Yorkists and Lancastrians on 10 July 1460 in the area now known as Delapré Park and the 50-60mm diameter ball was originally found on farmland in the area of Eagle Drive, Northampton, part of the English Heritage registered battlefield. The ball was actually found several years ago by the late Stuart Allwork, but had been believed lost until last year. Since its rediscovery the cannon ball has been subjected to detailed analysis by Dr Glenn Foard, one of the UK’s leading experts on medieval artillery and noted battlefield archaeologist from Huddersfield University. Dr Foard also led the team that found the true site of the Battle of Bosworth. A programme of research and scientific testing of the ball is ongoing, Dr Foard has concluded that “It is highly likely that the projectile was fired during the battle in 1460”. The Eagle Drive Cannon Ball itself has suffered massive impact damage from at least two bounces, and one gouge still contains small fragments of Northampton Sand and Ironstone. A testimony to the immense forces in play as the shot ricocheted across the battlefield. Other damage may have been caused by the cannon ball hitting a tree. But whatever caused the damage it is a vivid reminder of the dangers of a medieval battlefield which could at any moment maim or kill without favour the lowliest peasant conscript, one of the most powerful nobles in the Kingdom or even a King. In August the same year James II of Scotland was killed by an exploding cannon at the siege of Roxburgh Castle. The whole area in which the cannon ball was found is of immense archaeological importance. Not only is it part of the 1460 battlefield, which contains large and well preserved areas of the medieval field system over which the battle was fought, it is also the site of a Roman villa or settlement. A possible Neolithic cursus of national importance and evidence of ancient trackways criss-cross the site of the find, showing the importance of the area during even earlier periods. Indeed, a number of other important finds from the Stone Age have also been found in the area. The Battle of Northampton itself is also unique in British military history. It was the only time a fortification was assaulted, the last time protracted negotiations proceeded a battle, and the only time a whole army was excommunicated during the Wars of the Roses. In its aftermath, Richard of York, the father of Richard III, laid claim to the throne for the first time, setting in train the series of violent and tragic events which eventually saw his son die on the field at Bosworth twenty five years later. Contemporary accounts suggest as many as 12,000 men could have been either killed during the battle, or trampled to death or drowned in the rout as the defeated Lancastrian Army tried desperately to escape. However, which side fired the Eagle Drive Cannon Ball is not known. 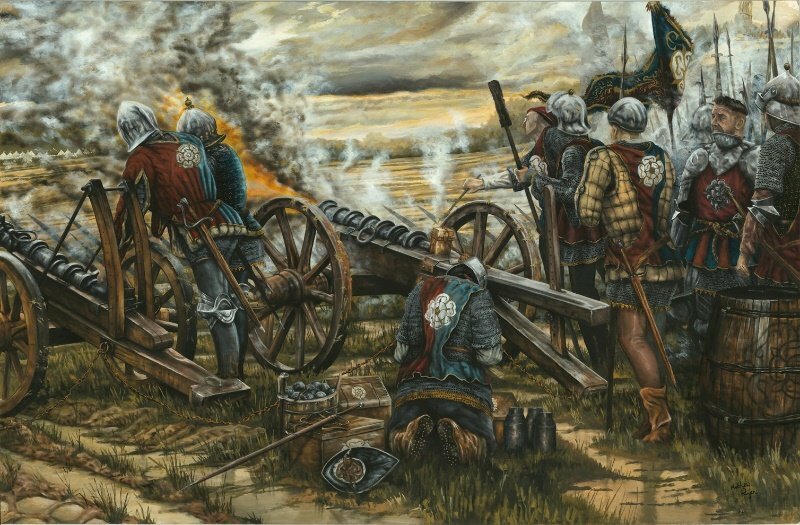 Both the Yorkist and Lancastrian armies are known to have had artillery available during the battle, although some contemporary accounts suggest that the Lancastrian guns failed to fire because of the rain. Therefore, the ball most likely originated as the Yorkist gunners targeted Lancastrian troops in their defences. Thus the find of the Eagle Drive Cannon Ball supports current theories about the position and orientation of the battle which form the basis of Northampton Council’s Conservation Plan for the site which was adopted in 2014. Northampton Battlefield Society was originally formed to promote and protect from development the site of the 1460 Battle of Northampton. In 2014, they were awarded a Community Star Award by the local community, for their work to protect the battlefield. They also continue research into conflicts of other periods and the numerous other battles that took place throughout the county, from Saxons and Vikings, through the Barons’ Wars, to the Wars of the Roses and the English Civil War. The patrons of the Society are Charles Chetwynd-Talbot, 22nd Earl of Shrewsbury, whose ancestor fought and died at the 1460 battle, and world famous author of historical novels, Bernard Cornwell. The Society has over 320 on-line members and holds regular monthly meetings with speakers on a variety of historical topics. The Battle of Northampton took place on 10 July 1460 during the Wars of the Roses. It was the first major battle of the wars where the full armies fought, it was the first time artillery was used in England in any quantity, the last time a fortified encampment was assaulted during the wars, and resulted in the King Henry VI being taken prisoner. It also sparked Richard of York’s claim on the throne and much of the bloodshed that cumulated in the Battle of Towton began here. Saved from development by the efforts of local people in 2012, but the site of the battle remains under threat, despite it being an English Heritage registered battlefield.